LiveU provides a new IP satellite and cellular bonding video solution. 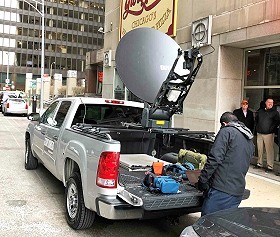 Hackensack, NJ, March 2018: LiveU has made it easier and more cost-effective for customers to cover news and events live wherever they are in the world by combining LiveU’s HEVC bonding technology with satellite connectivity service. This now gives customers “the best of both worlds” – a robust hybrid live solution that fits their production needs, streamlines the workflow, and simplifies the billing structure. Customers of LiveU’s award-winning LU600 can now not only broadcast double the number of hours with the same data using the HEVC encoding, but also have the ability to include a satellite connection (flyaway or driveaway options) whenever it is desired, without needing a reservation or getting multiple bills from different providers*. “Our bundled solution will change the game for our customers by removing any bandwidth concern, simplifying the workflow, and ending billing confusion for data,” said Mike Savello, LiveU VP of Sales (Americas). Visit LiveU at NAB 2018 Booth #C2617 to learn more about this solution, and all our other technology innovations, or visit get.liveu.tv to get more information. *This specific offer is currently available in the US.